The CRPL Summer Dare Everywhere volunteers (Susy Jones, Sandy Steckler, Jeri Vincent, and Vicki Brubaker) are finalists for United Way’s Outstanding Group Volunteer Award. Last summer, the Cedar Rapids Public Library piloted a new summer reading outreach program, Summer Dare Everywhere, with the Cedar Rapids Metro YMCA. The program brought the library to youth who had barriers accessing library resources and programs. 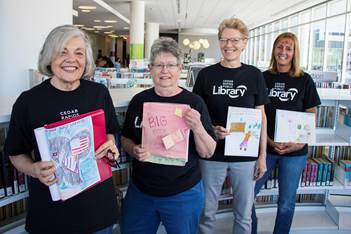 The four volunteers who helped launch this program made weekly visits to two YMCA sites to bring books, crafts, tablets, and activities to children ages 5–12 who attend YMCA’s summer childcare camp. During pilot program, volunteers delivered more than 675 books. Without these volunteers expanding the library beyond its walls, this program wouldn’t have been possible and youth would have been far underserved. The volunteers were resourceful and flexible in helping the library develop the program and were instrumental to its success. These fantastic volunteers helped launch the Summer Dare Everywhere outreach program with Library staff and the YMCA last summer. The program went on to receive a national Penguin Random House Library Award for Innovation this January. The award included a $1,000 grant and an additional $1,000 book donation to the library. Please help us celebrate and support these great volunteers by voting as often as you can here: https://www.uweci.org/get-involved/nonprofit/volunteer-recognition/volunteer-awards/vote4volunteers/. Feel free to share this with others! Voting is open until Friday, April 7. The Outstanding Volunteer awards are presented annually by United Way of East Central Iowa. Award winners are selected through a community voting process on the UWECI website. Winners receive $500 to donate to a non-profit – that would buy a lot of books for this growing program. Therefore, we need your vote for the Summer Dare Everywhere volunteers! Please take a minute to recognize these outstanding volunteers and their dedicated work for the library and the community by voting!